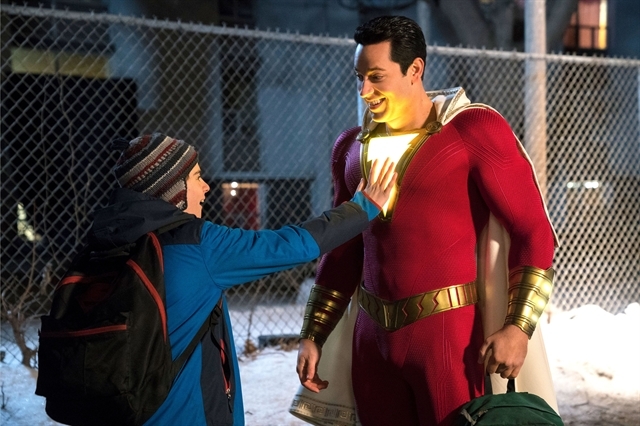 LOS ANGELES — With estimated ticket sales of US$53.4 million in its opening weekend, Warner Bros.' Shazam! showed that North American movie fans can enjoy a lighter spin on the usual dark superhero tale, industry watcher Exhibitor Relations reported on Sunday. Its domestic take for the three-day weekend was not a bad return on the $80 million Warner and New Line spent to make it – particularly considering overseas ticket sales of $102 million so far. Another new release, horror film Pet Sematary – a remake of the 1989 film based on the Stephen King book – had a solid $25 million in ticket sales, $4 million more than Paramount spent to produce it, Variety reported. In third spot was last weekend's box office leader, Disney's Dumbo, at $18.2 million, down 60 percent from its opening. The Tim Burton remake of the original 1941 film tells the story of a small elephant with huge ears and a powerful desire to be reunited with his mama. Fourth place, at $13.8 million, went to Universal's Us from writer/director Jordan Peele. It stars Lupita Nyong'o and Winston Duke as a couple frighteningly confronted by their own doubles. And fifth was Disney's Captain Marvel, taking in $12.7 million. Oscar winner Brie Larson stars as a former fighter pilot with superpowers.